Modern cleaning systems are today unthinkable without reliable sensors. unthinkable without reliable sensors. Ever-increasing pressure on the costs of food production results in ever-increasing automation, including for equipment used for cleaning. In this area many production facilities have hidden but significant potential for savings. In addition to optimal design and control addition to optimal design and control of the plant, the process “eye”, the sensor, is becoming increasingly significant. 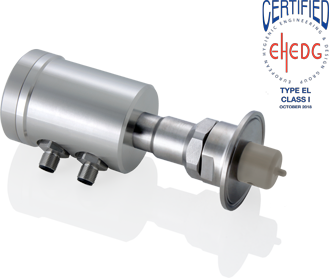 Important considerations in the selection of the sensors for CIP are precision, robustness, durability, wear-free measuring and a competent partner that measuring and a competent partner that should preferably be able to be a single supplier of gle supplier of the whole range of sensors. of sensors. The company Negele Messtechnik has a solution for all these requirements and can supply all the sensors required for CIP systems from one source. This fact and the existing long-term good partnership between Negele and Milchwerk Hawangen were the deciding factors when the dairy opted to procure all the sensors for a new CIP system from Negele. With this system as an example, the following gives an outline of the sensors employed and their roles. 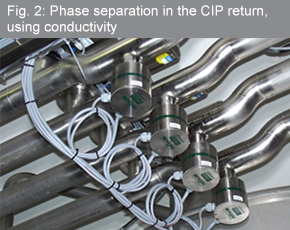 The CIP system in question consists of four lines, is connected to the whole of the dairy, and cleans all containers and plant in all areas. The cleaning agents used are the usual ones: caustic soda, nitric acid and water. In some areas a single-phase cleaner is also used. The cleaning process is typically as follows: Final CIP rinse water as pre-rinse, caustic soda, water, nitric acid, water. 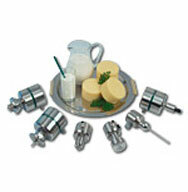 Milchwerk Haflow measurement a magnetic-inductive flowmeter, e.g. type FMA from Negele (Figure 1) can be employed. This way, the optimal quantity at the optimal speed for each section to be cleaned is pumped into the system. For effective cleaning, the feed pressure is important in addition to the flow rate. For pressure measurement a process pressure sensor is used, here of type DAN-341, a two-wire sensor that transmits the inlet Sensors for CIP equipment The dairy Milchwerk Hawangen uses Negele to supply components wangen processes about 100 million litres of milk each year, producing Cheshire cheese and other products and supplies many well-known customers across Europe. Before the CIP agents are sent from the containers into the equipment, a number of parameters have to be correctly set or controlled. First, a heat exchanger heats the cleaning agent to the correct temperature. 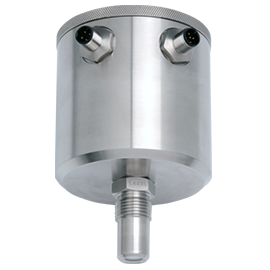 Temperature measurement here is done with a Negele TFP-41 sensor with integrated transducer. The temperature is thus given directly to the PLC that controls the inlet temperature to the correct value. In addition to the temperature, the feed power is also important. This is monitored through the parameters flow rate and feed pressure. 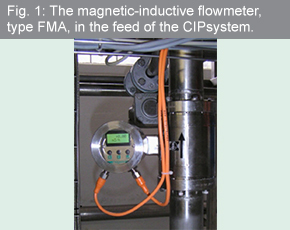 For accurate volumetric flow measurement a magnetic-inductive flowmeter, e.g. type FMA from Negele (Figure 1) can be employed. This way, the optimal quantity at the optimal speed for each section to be cleaned is pumped into the system. For effective cleaning, the feed pressure is important in addition to the flow rate. For pressure measurement a process pressure sensor is used, here of type DAN-341, a two-wire sensor that transmits the inlet pressure to the controller. From there the pressure is set to the correct value as required for the section to be cleaned. The temperature of the returning cleaning agent is measured again in the return line. If this is not below a certain threshold, this gives an assurance that the cleaning temperature in the equipment was correct and the cleaning was done under optimal conditions. This measurement is also done by a temperature sensor of type TPF-41.To ensure that the returning cleaning agent reaches the correct storage container, inductive conductivity sensors are usually used, type ILM-2 in this case (Figure 2). From the different conductivities of the cleaning agents measured by the sensor, the PLC recognizes which one is flowing through the return pipe and sets the valves to return it into the correct feed container. If there is a change, e.g. water to acid, at the end of a cleaning stage, this is recognized by the PLC which then sets the valves so that the acid flows back into the acid container. As measurement errors at this point could cause considerable losses, a wear-free measurement device with long-term stability and quick response should be used. As Milchwerk Hawangen has already successfully used the Negele sensor type ILM for conductivity measurements in other applications for some years without problems, the repeat decision to use them was not difficult.Additionally a flow monitor is incorporated in each line of the return flow. This monitors if there is a flow in the return. This enables errors in valve positions or leaks in the equipment to be detected. 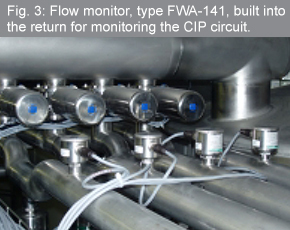 At Milchwerk Hawangen analog flow monitors of type FWA-141 with 4...20 mA outputs are used (Figure 3). Analog measurement in the return enables a rough comparison to be made between the feed and return flows; it also enables air entrapped during the cleaning to be detected - this causes significantly different flow speeds. The PLC then raises the feed power, thereby optimizing the cleaning.In cleaning the milk tanks the turbidity in the return is also measured during pre-rinsing and the so-called rinse-milk separation is done. Using the turbidity sensor ITM-2 a switching point is set for a residual concentration (milk in water) defined by the operator. Depending on this value the milk-water mixture is directed either to the collecting container for the animal feed industry or to waste water. In Hawagen there are altogether five storage containers for: Water, final CIP rinse water, caustic soda, nitric acid and single-phase cleaner. Each container is equipped with a continuous level sensor type NSK. With its potentiometric measurement method, this sensor has the advantage that foam and deposits, even in the non-wetted part of the sensor rod, do not influence the measurement. With these advantageous properties, the PLC display can give a reliable indication of the fill level. Additionally, a temperature sensor and limit sensors are installed in each container. To detect the empty and full states, capacitive level sensors NWM- 141 from Negele were built into the tank wall. This measuring method has the advantage that the medium is detected reliably even if there is a deposit, film or foam on the sensor tip. For economy of space, cleaning agents are supplied in the form of concentrate. Therefore, the desired concentration value is set on site for each agent. Concentration reduction is achieved by defined dilution with water. For automating this job, conductivity sensors are again very well suited as the conductivities of the cleaning agents depend directly on their concentrations. For example, if a controlled concentration of 2 % is required in the caustic soda container, the conductivity is used as a parameter. A 2 % solution of caustic soda has a conductivity of about 85 mS/cm. The concentration of nitric acid can be controlled in the same way, but with different numerical values. In each of these cases it is important that the temperature dependence of the conductivity is compensated in the form of a correctly set temperature coefficient. As cleaning agents always mix in the storage containers to a small amount, caused by the switching processes, their concentrations need to be monitored not only at the start, but continuously, and adjusted if necessary. The new CIP system with its sophisticated control and the Negele sensors fitted provides for a significantly more effective cleaning process than its predecessor. This applies to the quality of the cleaning as much as to the consumption of concentrate and the cleaning times. Compared to the past, this gives in the course of a year considerable savings and at the same time increasing quality. The investment in the new CIP equipment has therefore paid for itself over a short period.